I was hired as the Adult Services Manager at the Tiffin-Seneca Public Library three years ago. 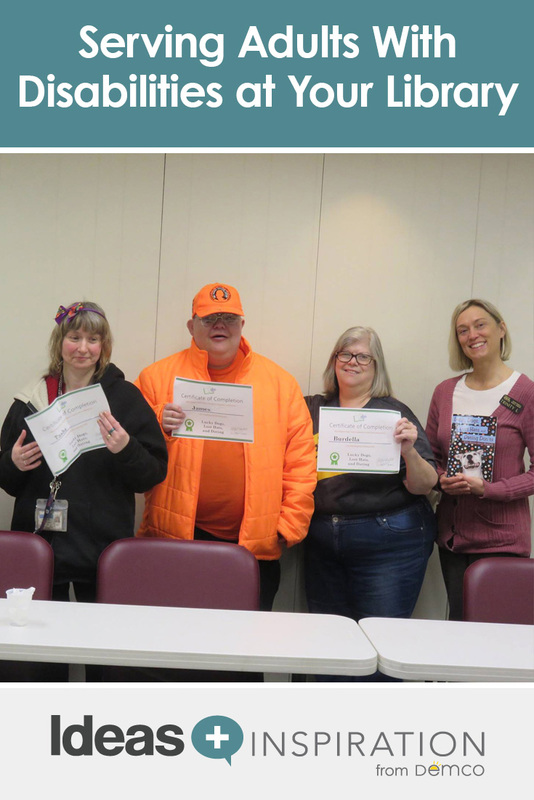 Since I started, our library has begun partnering with the Seneca County Opportunity Center to expand our services to people with disabilities. The Opportunity Center serves individuals in our county by providing habilitation services and offering employment in a workshop setting. Although I have lived in the community for most of my life, I knew very little about the Opportunity Center or its programs and services. Shortly after I started working at the library, a staff member from the Opportunity Center asked me about bringing a group of adults to the library for a visit. I was more than willing to welcome the group to the library, but I wasn’t sure what kind of program to prepare. 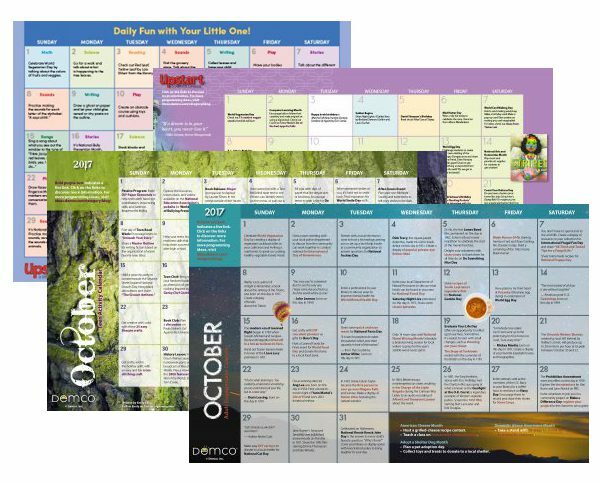 Right around this time I discovered Demco’s monthly activity calendars. The best part about the calendars is that Demco does all the work! I am sure I am not the only librarian who feels there are not enough hours in the day to get everything done, and I don’t have time to do this research on my own. I love that Demco does it for me and provides related websites and book titles to go with the events. A group from the Opportunity Center now visits the library every month, and I use these calendars to prepare a PowerPoint presentation for them. I look at all the calendars and pick and choose the events that I think the group will find most appealing. The calendars often have links to websites with games and activities, many of which incorporate literacy skills, related to one of the month’s holidays. We meet in the library’s computer lab, so at the end of the session they can play the games or explore the websites we discussed. Our initial relationship has now turned into a wonderful partnership. Staff and workers from the Opportunity Center now also provide services to our library patrons in the form of a monthly craft program. They plan the craft, gather supplies and teach our library patrons how to make it. This successful “Get Crafty” program has been going on for more than two years. Our patrons love learning a new craft each month, and it offers a chance for them to socialize with the workers from the Opportunity Center. The program relies on donated materials, and they upcycle a lot of items, so our patrons and library staff have started donating items to the program for future projects. Another way we have partnered with the Opportunity Center is by establishing a Next Chapter Book Club. 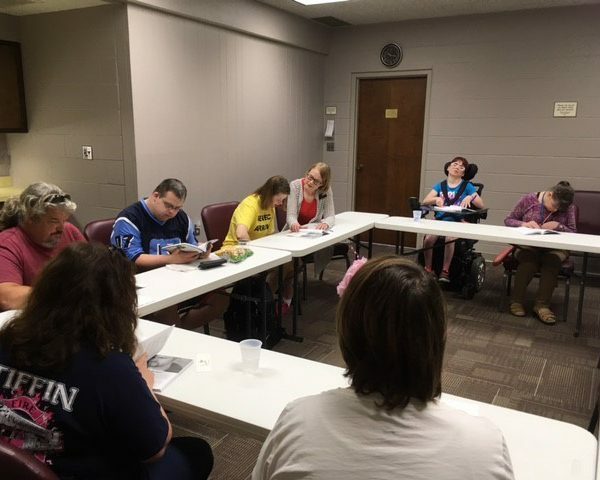 The Next Chapter Book Club was founded in 2002 as a way for people with intellectual and developmental disabilities to enjoy books and be involved in their community. The organization is affiliated with The Ohio State University, and now there are hundreds of groups across the country and in Europe and Australia. Every other week, our group meets to read and discuss a book. The first book we read was Lucky Dogs, Lost Hats, and Dating Don’ts: Hi-Lo Stories About Real Life. It is a short story collection featuring characters with and without disabilities as they face real-life topics and scenarios. The book was written by staff of the Next Chapter Book Club in response to book club members’ requests to read about adult topics. 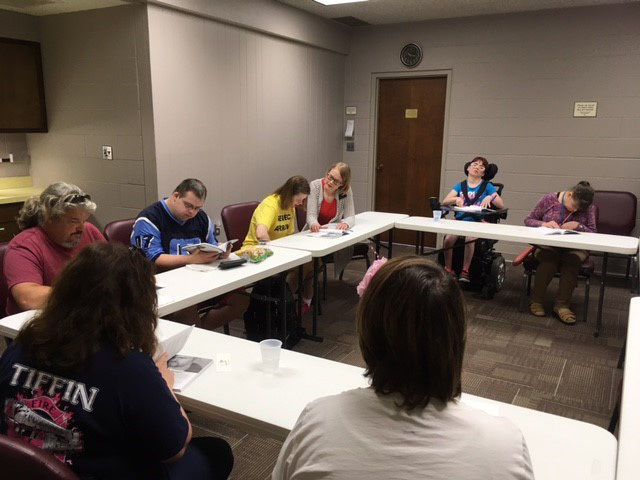 This spring, the book club participated in our annual Community Read by reading Farmed Out by Christie Goerzen, one of this year’s selected titles. Currently, the group is reading Beverly Cleary’s classic The Mouse and the Motorcycle, and they can’t wait to find out what will happen to Ralph! We just started a second group this month so that even more people can participate in the Next Chapter Book Club. One of the benefits of working with individuals from the Opportunity Center is that it has made us better librarians. Our staff has a greater awareness about people with disabilities — and their abilities. Now that we know each other better, they are less hesitant to approach library staff and ask for help when they visit the library on their own. And because we know more about their interests, our staff can provide better service when helping them find materials. The best part of our partnership is that our relationships now extend beyond the library walls, whether that comes in the form of library staff attending events hosted by the Opportunity Center or stopping to talk when we run into each other at the grocery store or at community events. 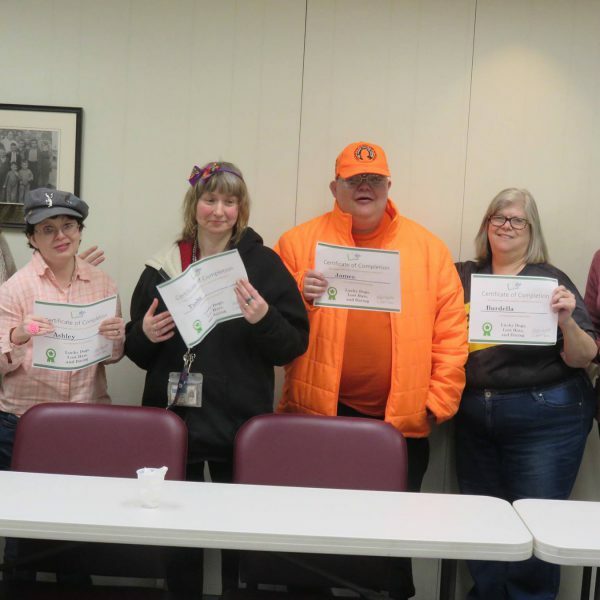 The Tiffin-Seneca Public Library looks forward to doing even more to serve patrons with disabilities in our community, and we are excited about the possibilities ahead. Trinity has been the Adult Services Manager at the Tiffin-Seneca Public Library since 2014. Prior to that she served as a librarian for the Ohio Department of Rehabilitation and Correction. Trinity earned a master’s in Library and Information Science from Kent State University and is a certified K–12 Library Media Specialist. She is also licensed to teach English and was a junior high and high school English teacher. 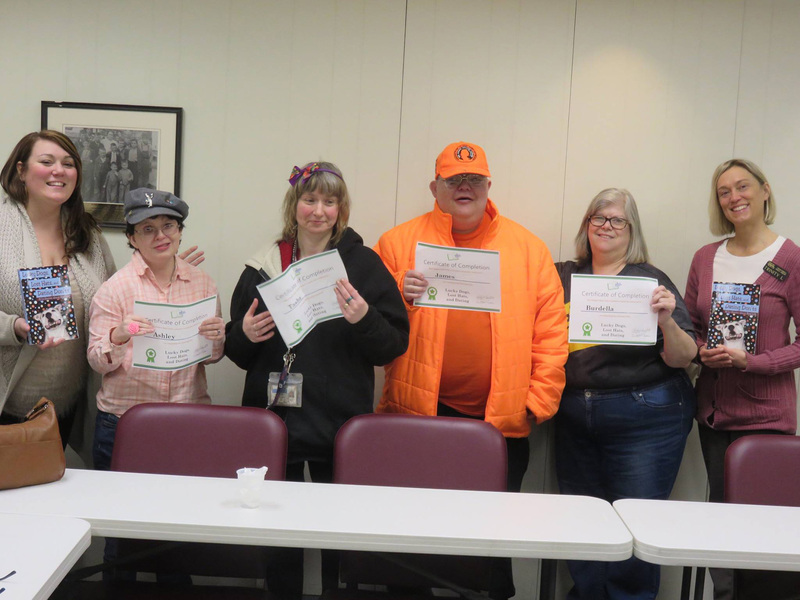 Trinity is active in the Ohio Library Council as a member of the program committee that helps plan the organization’s annual Convention and Expo.